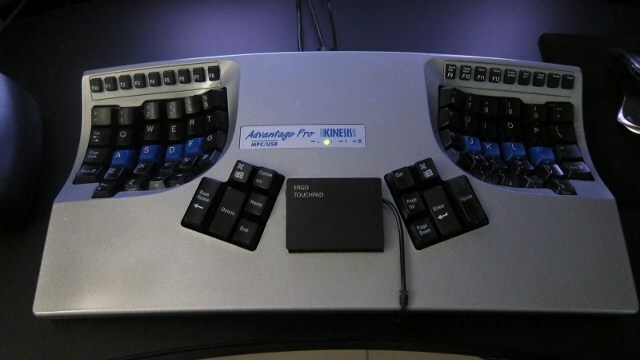 I use a Kinesis ergonomic keyboard. I use a mouse as well; but I like having a touchpad handy. They’re especially convenient for scrolling without going to the mouse. Considering how widespread touchpads are on laptops, they’re rather scarce as desktop accessories. Aside from Cirque’s Smart Cat line (also rebranded by Adesso), there’s really not much out there. I tried perching a Smart Cat in the (rather abundant) space between the Kinesis keyboards key wells. I had to replace the rubber feet with thicker ones to raise it up a tad; this surface of the keyboard where it sits is slightly convex. But it was never as convenient to use as I’d hoped. I thought this was because, between the rubber feet and the thickness of the device, it just wound up being raised up too much. I came across ErgonomicTouchpad.com a few months back. This site looks like it could have been adapted from a television infomercial; so someone capable of firing a synapse will naturally feel somewhat embarassed while looking at it. What they’re selling is simply a touchpad with the same characteristics as the Cirque GlidePoint (i.e., tap-click, secondary tap-click in the upper right corner, vertical scroll on the right) with no bezel or housing to speak of—just a velcro backing. Two sizes are available. The larger one fits comfortably in the same spot where I had the Smart Cat; and I figured it would resolve the height issue I had with the Smart Cat. And I suppose it did. But rather than be easy to use, it just pointed out that the device height wasn’t really the problem. The problem was that I still had to pick my hand up off the keyboard to use it. And if I was going to do that, I might as well use the mouse. So now I’ve got the little one positioned between the thumb keys on the keyboard. This works pretty well. I can just slight my right hand over a bit to work the scroll area; and if I pivot my hand, I can work the touchpad with my index finger.